One of the things that I love about my generation is the ability to take risks when it comes to business. I have read a lot of articles about millennials and their never ending pursuit of finding the right formula or balance between doing what you love and surviving the world on a daily basis. Another thing that I appreciate about my generation is the love for art and the increasing amount of people who become more aware of handmade craftsmanship and organic living. 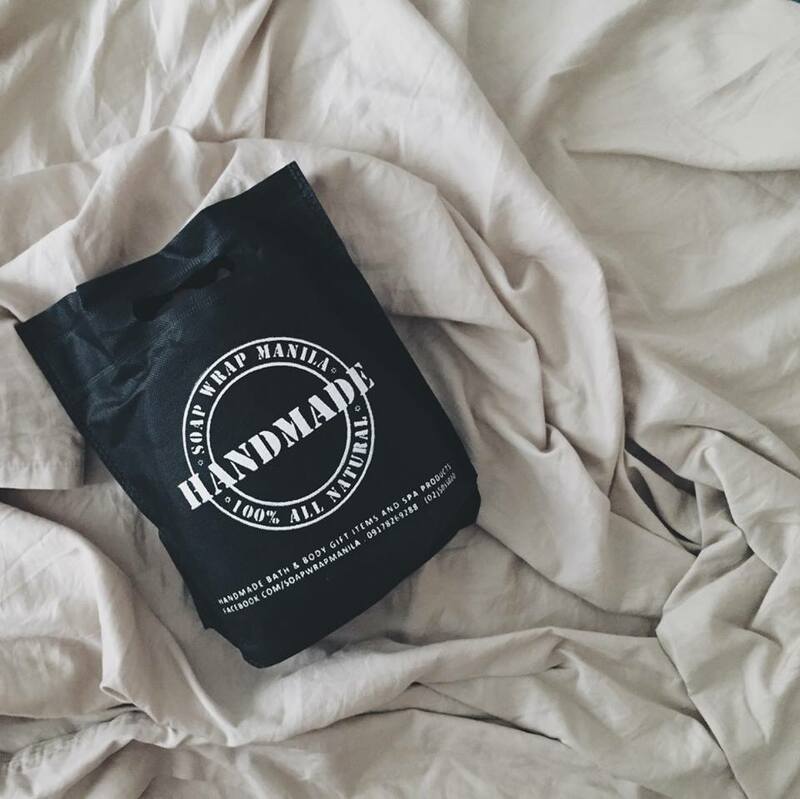 One of the handmade brands that I have currently discovered is Soap Wrap Manila. The brainchild of my dear friend from College, Tanya Dela Cruz. I remember her introducing the brand to me last year and how ecstatic she was about starting her own brand while balancing the life of being a new mom to her daughter, Tali. What started as a hobby while being pregnant became an expansion of all sorts of wonderful. From customizing bath soaps, spa products, to supplying for Hotel toiletries and Spa products, the brand has indeed come a long way. This pretty little thing is a solid perfume. What I love about it, beside its handy and pretty packaging is the subtle, sweet hint of the BVLGARI Amethyst. One thing that's good about owning a solid perfume is the hassle-free application. Put in an ample amount in your ring or index finger and simply rub it in your neck and wrists. If you're not much of a perfume girl like me, this trick would do. Another good thing about it is that you won't be pestering your husband or anyone in particular by spraying on them of making them suffer the strong whiff after one spray. The lip balm has the same size as the solid perfume only less bulkier and heavier. If you need a good product to moisturize your lips without having a sticky, glossy feeling, this is a perfect go to. I have been applying this every night before sleeping and have been waking up with a soft moisturized lips. And since I am not a lipstick gal, I simply use this now as a topcoat to my lip tint. It says unscented in the packaging, but there's a little hint of melon in it. Maybe it's just me, but I love the subtle relaxing scent it gives off. Made of Virgin coconut oil, sweet almond oil, cocoa butter, vitamin E oil, soy wax, and melon fragrance, this Hand Balm if the perfect handy moisturizing product for your hands, elbows, knees, and feet. I get occasional cases of having dry heels after a long day wearing open sandals and I have been applying this product to my feet to keep it moisturized and protected from drying or cracking. 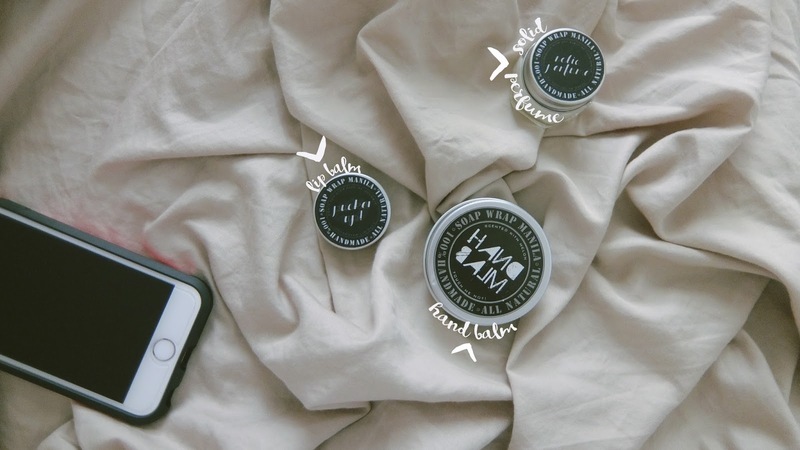 If boys have their pomade or wax in their bags all the time, then this hand balm should be a must for us. The expression "To pretty to use" best applies to this particular product of Soap Wrap Manila. One thing that is fun about the brand is their ability to design and customize the soap or bath salts to your particular liking. I have yet to convince myself that this is a soap and that it has to be used! Made from virgin coconut oil, palm oil, and goat's milk, this body soap is set to relax your skin after a long day at work or to boost you up for a long day. It's almost Christmas, have you made your Christmas Shopping? If not, I definitely recommend a more personal, hand made product for you to share with your love ones this season! Contact Soap Wrap Manila now and tell them what you need.